Qualified Cards: RCBC Bankard Mastercard and Visa cardholders. Log in or subscribe to Booking.com. Search for accommodation and travel dates, and select preferred accommodation. Enter the required booking details and continue. On the reservation page, enter the card details of the qualified RCBC Bankard Mastercard or Visa Credit Card. This page has a consent box that allows Booking.com to share the credit card information with its fulfillment partner for processing of the cashback. Make sure this remains ticked. Booking confirmation will be sent to the email address used for the reservation. Bookings made through Booking.com/RCBCBankard. Bookings made through the Booking.com mobile app or www.booking.com are not qualified for the cashback. Cardholders who are logged in to Booking.com. New users may create an account and log in. Cardholders who have given consent to share their Credit Card details to Booking.com’s fulfillment partner for processing of the cashback by ticking on the consent box. Stayed bookings, in which a qualified RCBC Bankard Mastercard or Visa Credit Card is used as payment to the accommodation. Cancelled, “no show” and bookings with changes to the credit card details after the booking process are not eligible for the offer. Accommodations that do not accept credit card or only accept cash as mode of payment are not eligible for the offer. The cashback will be credited to the cardholder’s billing statement within sixty five (65) days after completion of stay in the accommodation. The cashback is only applicable for room charges. Other fees and charges, including but not limited to taxes, service charges, food and beverage, or room service charges will not be eligible for the cashback. The cashback will be calculated based on the original booking value in Euros and will be credited in Euros, subject to foreign exchange charges. Should any amendments be made after the booking, the cashback will be adjusted accordingly and will be calculated based on the latest booking value. The offer is non-transferable, non-cumulative and cannot be exchanged for cash or other products and be used in conjunction with any other discount, promotions, discounted items and fixed price unless otherwise stated. In case of dispute with regard to the customer’s eligibility and availment of the promo, the decision of Booking.com and RCBC Bankard with the concurrence of DTI shall be considered final. 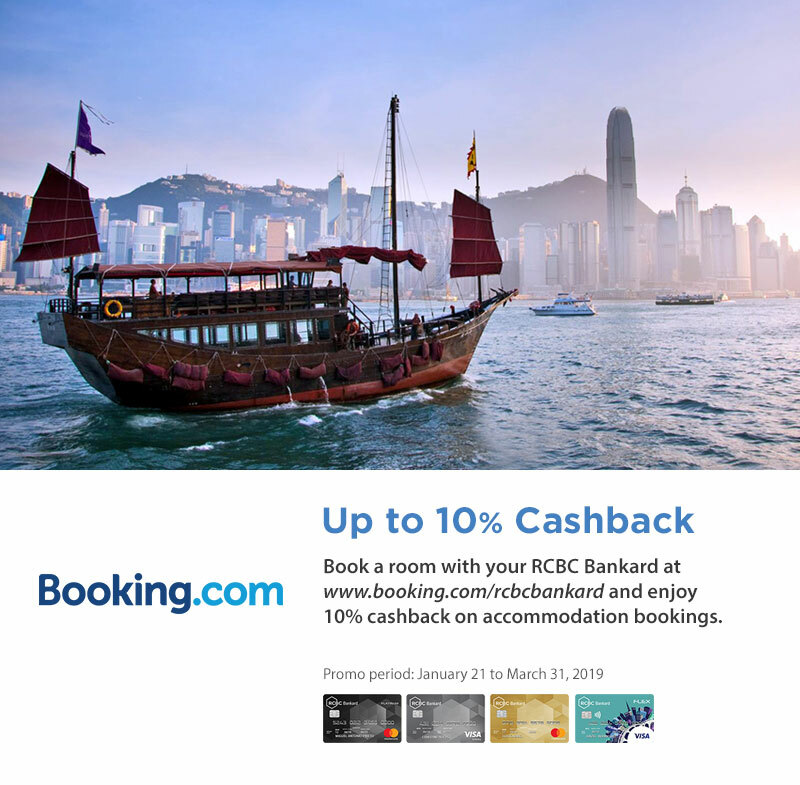 However, if dispute involves Booking.com and its performance and/or delivery of services and/or products to customers, subject to the Promo Mechanics and Terms stated above, the decision of Booking.com and RCBC Bankard with the concurrence of DTI shall be considered final.